Think about your favorite color and try to explain the reasons behind having chosen it. Depending on who you are, you might say that your preference says something about you, or that it defines your uniqueness and your personality (to name a few catch-all reasons). It’s clear that there’s a plethora of things and thoughts one might muster in the hope of justifying color preference — and yet for all the variety behind our choosing of favorite colors, hues, and shades, it seems that our choices are almost always strikingly dull. A survey that looked at color preference in 30 different countries concluded that predilection to certain colors is more a matter of things like gender and age, with other particularities (such as geographic location) being much less of an influence. What’s more, University of Maryland sociologist Philip Cohen found a 78% correlation between the answers given by men and women when asked what their favorite color was after surveying 2,000 people. Coincidentally, the top choice for both sexes was the color blue, with green as the overall second best. So while we might all be different with respect to each other, when seen by demographic groups our tastes seem to be predictable. In some ways, this shouldn’t surprise us. This appeal also seeps into our taste: Americans overwhelmingly prefer seeing paintings of outdoor scenes (88% to 5% for indoors), and they’re partial to seeing things like lakes, rivers and oceans (49%) and forests (19%) — namely, lots and lots of shades of blue and green. So is it enough to explain color preference as a matter of human nature, or is there something else that influences how people choose their favorite colors? The science of color points to it as the resulting sensation our eyes pick up from light refraction. Taking this into account, we might as well just say that color is only that which we (humans) can distinguish — and as such the tally would revolve from somewhere around 1 million to about 7 million, with a lot of leeway at the top part of the range. And even so, there’s no real way to say for sure how many colors there are. On a (very) rough estimate, the total number of colors that actually exist and that we could quantifiably distinguish (despite us not being able to see them) is 18×10³³ — a number so large that some have just concluded that the Universe offers an infinite number of color shades. Still, we talk about them. We give them names and associate things to them, at times linking powerful beliefs around colors. But in reality, color names point more to concepts rather than to the real thing. Take white: it’s understood as the complete refraction of light from an object. Conversely, black is the complete absorption of light. In nature we almost never come across such absolutes in how light interacts with matter — white and black are to this extent ideational. They’re concepts around which we approximate. So while there would arguably be such hues as perfect blue or perfect green, for the most part, we shotgun our approach based on the closeness to our ideal of blue or green. And we do this because, as is the case with most other human attempts to understand the uncountable, we use simplifications based on what’s most evident. Isaac Newton is credited with having created the bias we have for the colors of the rainbow (and, of course, having pushed chromatic theory into the scientific paradigm) once he described the way white light splits into distinguishable colors after passing through a prism. What’s more, he also showed how one could re-create white light by passing different wavelengths of light back through a prism. This evolution in color perception spurred a meticulous undertaking of trying to understand colors and the ways in which they interact with each other in a methodological way — so not just based on aesthetics. In turn, the spread of knowledge around colors has shaped modernity so much that it’s hard to believe that other humans might perceive what their eyes are picking up on in different ways. But our understanding of what the eye can see appears to be as much a biological as a social process: what we call color is heavily reliant on our cultural background. African peoples have been shown to use a completely different color categorization than what Western societies do, distinguishing between what I for one might consider identical shades of green. It would seem that the concept of color, for all its universality in the human species, is ultimately rather subjective. Still, humans have tried to put color in a taxonomy ever since taxonomies came about. One of the earliest color charts was devised in 1686 by a man named Richard Waller — and was a structured attempt at showing how colors shade into one another and how they interact. Waller’s work is appealing — it looks pretty and it seems meticulous. But humans have been dabbing with colors for much longer than the mid-1600s. Colors occupy an immense space in our societies, and even though the proliferation of chromatic science (and pseudoscience alike) has only recently become a thing in itself, it can be argued that we owe our very nature to the adaptive trait of recognizing hues and associating symbols with them. Archeological records from the Paleolithic show that art and color were incorporated at roughly the same time in our species’ development. Modern humans first started using color so as to paint some 50,000 years ago — and remarkably, it would seem that it was polychromatic from the get-go. Still, while we might take pride at the artistic aptitudes of early man, this should not be understood as a unique ability. Seeing in colors came about long before humans; and most other things for that matter. Some 800 million years ago, almost alongside the development of eye itself, photoreceptor cells which convert light into nerve signals appeared in early living things, and while there are at least ten different types of eye systems on planet Earth, it’s believed that the ability to distinguish colors evolved in all life from a single common ancestor. Since then the planet has been populated by all sort of creatures that make use of their vision in a chromatic way to serve four very well defined roles in nature: attract or repel members of the same species, and conversely, attract or repel members of another species. And we humans are very good at these four functions — at least as mammals go. We might lack the ability to see ultraviolet or see well in the dark, but most mammals lack the full depth of color perception that humans have (and share alongside the Great Apes and the Old World Monkeys). But while using pigments as a means of coloring the things around us might be a prehistoric practice, it’s only very recently that humans have started developing ways of artificially making colors that once required vast amounts of effort and patience to get our hands on. Modern science and industry have caused colors to become rather mundane — we find them readily available and it takes little exercise to acquire or change things around us based on our color preferences. In light of modern technology and science, we’ve incorporated colors into absolutely everything we do. Interestingly enough, research shows that despite this chromatic bounty, we’re still rather boring when it comes to the colors we prefer, showing no true loyalty to a particular sort. A survey done on American citizens suggests that people tend to like vibrant (36%) and pale (32%) shades of a color, with a slight distaste for darker tones (22%). One cluster of hypotheses around this hints to the fact that we are primed for certain bodily reactions when exposed to specific colors (like becoming physically weakened after being exposed to shades of pink, more creative when surrounded by green, and smarter when around the color blue). If there’s truth to these results, it should also follow that we’re more instinctual than we might like to admit and that we use colors for the very reasons our ancestors did: to distinguish safe things from dangerous ones. Only it’s more complicated than just that. 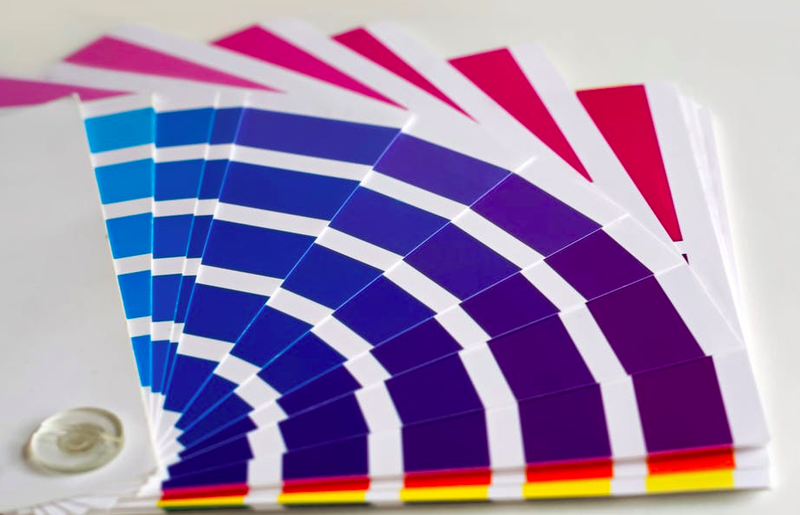 Recent studies have come to shine a new light on our perception of color, as it seems that we take it in twice: our initial reactions to color are instinctual, and yet we also have the ability to take a second jab at color due to our metacognition. This means that we react very quickly when colors are out of place, and yet given the right circumstances we might enjoy tinges and tints that contrast out of the background — and it’s this second level of perception that seems to give us the ability to choose a favorite color in the first place. While likening preference for water and greenery to the preference for blue and green might seem like a long shot for some, further research strengthens the idea that blue really is the most popular of colors. In a now famous 2003 study that surveyed people from 22 countries, researcher Joe Hallock found blue as the overall most popular color. Why that is, he couldn’t say for sure. What’s more, blue was almost never chosen as a least favorite color by the people in Hallock’s sample, indicating that even if folks considered other colors as more appealing than blue, they almost never found blue unappealing. This comes into accord with further surveying of US citizens that also points to the fact that people overwhelmingly like blues, despite some outliers in terms of how much they dislike it (namely, young adults dislike blue more than they do the color black). Age-wise, it would seem that people tend to like blue more and more the older they are and that our lack of preference for other colors shifts and changes as we split the sample cross-generationally. One reason for this could be that the younger people are, the more volatile they appear in their attitude towards choosing favorite colors. But even children seem to have a soft side for blue (or maybe their parents do? ): in 1993 and then again in 2000 the Crayola company found that blue was the most popular of its colored crayons in the US. This trend also stands when looking at differences between sexes. While men might like blue overwhelmingly more than women do, the latter still mention it as their favorite color most of the time. Reasons for this are boundless. Of course, people have tried putting colors into neat boxes that describe their properties and the effects they have on us for a while now — and most of this is methodological garbage and mysticism. What is true is that certain tints, shades, and hues get used overwhelmingly in certain situations, leading to a possible bias for them. And blue is a prime example of this. There are a lot of explanations behind how we react to colors, but the gist of it comes down to a few principles: colors carry meaning for us, and that meaning can be both innate or acquired. Either way, individual experience and perception of color occurs without requiring any mental strain on our part, and as such colors can (and do) cause us to act in certain ways depending on the contexts we’re in — leading to both a preference for some, and an inclination to do certain things or react in certain ways according to what colors we see. And even now while drafting this article, I see the hyperlinks I use coded in blue — and the blue outlines of the buttons in Google Docs. 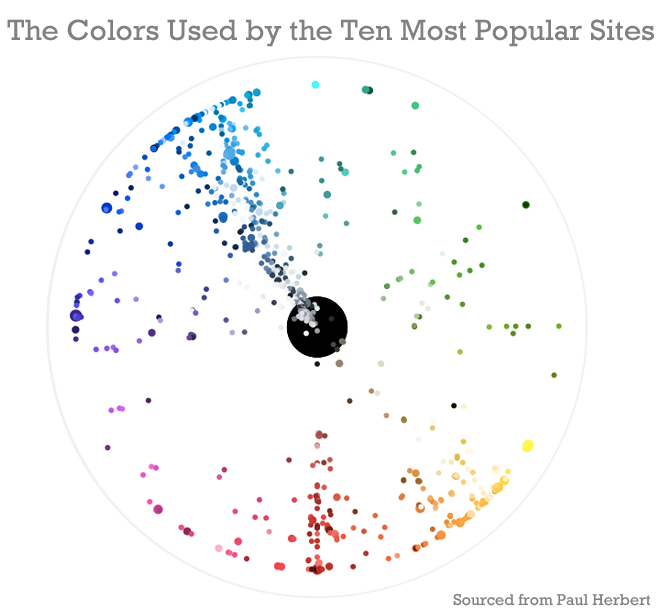 This is no coincidence — in the latest release of his work on scraping the world’s most popular websites, Paul Herbert showed how the color blue came up as one of the (if not the) most popular choices for web design. Of course, blue gets used a lot on the internet because we’re not biased towards understanding something particular out of it (like how red shows errors or yellow important bits). Essentially, blue is the color of clear communication, and this is due in no small part to how almost everybody can recognize it — as even color blind people can see it well enough without much effort. What’s more, blue shows up as being one of the best selling color shades for interior design and architecture, and has become a color associated with political liberalism, Christianity and even modern corporate culture — all things that have spread worldwide in recent history, and have gone into warp-drive with the advent of the internet. 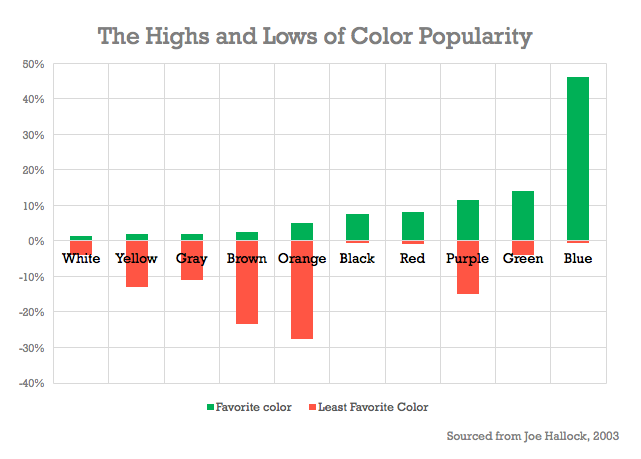 As Hallock’s results point out, there’s a weak correlation (72%) between how much people dislike colors and how cheap or inexpensive they perceive those colors to be. 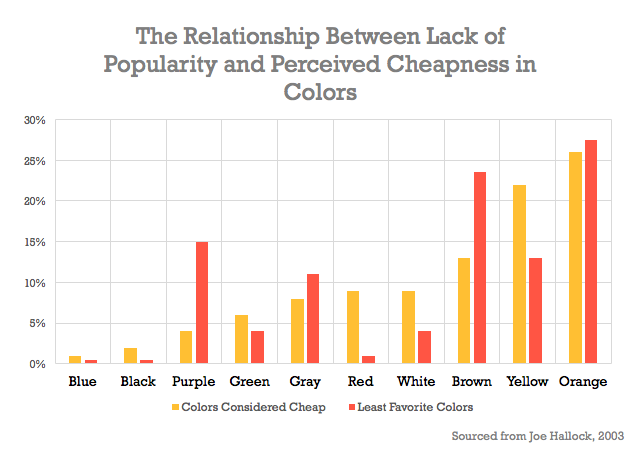 Said differently, the color blue — which tends to not be singled out as least favorite by almost anyone — also has the characteristic of not seeming cheap to almost anyone. While this particularity might also be shared by other colors (such as black), it’s blue that stands out as the overall leader in what might be deemed “the people’s choice award”. Sure enough, there are plenty of cultural reasons invoked in the search for an answer to why blue is so liked. In Eastern cultures it seems to be associated with good health and even immortality, while in Western cultures it’s associated with things like trust and security, being perceived as a soothing and peaceful color. But its resilience also lies in the ability to portray deeper human emotions such as loneliness and sadness — giving it quite the perceptual range. Explanations aside, blue just happens to be very popular. Most of the people I’ve questioned have told me as much, as blue has come up again and again as a favorite. People just like it. Whether that says something about them is uncertain, but I believe it’s a safer bet if we say that it’s partly their instincts, partly cultural bias from the society in which they live, and partly taste. Either way, my favorite color is green — and I can’t for the life of me figure out why so many people like blue. Judd, Deane B.; Wyszecki, Günter (1975). Color in Business, Science and Industry. Wiley Series in Pure and Applied Optics (third ed.). New York: Wiley-Interscience. I do some marketing at Booking.com. Former IBM, Oracle.